Lives in the outer Pelorus Sound, an area of outstanding natural beauty within the Marlborough Sounds, New Zealand. Her passion is writing. She goes all out with it to the point that she’s a step short of crazy! But she cannot stop herself. For the past ten years there’s always been a story in the process, or in the front of her mind. PayPal now available. Postage free - New Zealand. The boys full of mischief and fun. The birds appear flashing their wings. Why does kererū annoy tūī? want other kids to know? 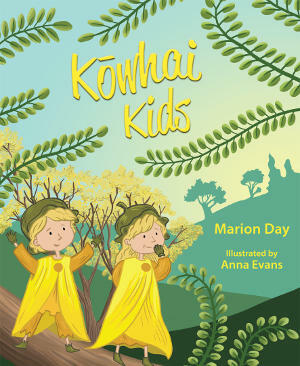 Kōwhai Kids is a creative non-fiction children’s picture book and the fifth in Marion’s successful nature series. Beautifully illustrated by New Zealand wildlife illustrator Anna Evans, children can learn about our native kōwhai through the eyes of its flowers. The kōwhai kids banter and play amongst the branches of their tree. 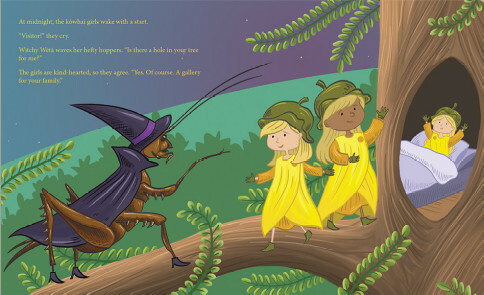 They receive visitors - some scary some friendly - but they’d really like other children to learn about their special tree. Kōwhai Kids begins with an info page and ends with a guide on how to grow a kōwhai tree. Marion Day lives in the Marlborough Sounds, New Zealand. Although she also writes for adults, she enjoys most writing for children, intermediate and young adult. She has won numerous awards for her writing - including being shortlisted in the Storylines Joy Cowley Award - her inspiration often coming from the natural elements around her. Other picture books by Marion are: Spiny Sebastian Starfish, The Little Feijoa Tree, Black Shag, Pepe & Tute, Uncle Tappit and Skiddies. Available from all good bookstores, and library and school suppliers.